Translating and treating your cold or flu symptoms shouldn’t add to your discomfort. While there are many similar symptoms between a cold and the flu, symptoms of the flu are quite unique. Stuffy, sneezy, and sore? Simply a cold. Common cold symptoms typically target the nose and throat. Fear not—drinking liquids and using a humidifier can help alleviate these symptoms within a few days, with the help of a bit of medicine. Symptoms such as sneezing, coughing, and nasal congestion may last up to 3-10 days. Fever and fatigue? It’s the flu. Unlike the more gradual progression of cold symptoms, you will experience a fast onset of symptoms—like fever and chills—in the early stages of the flu. Other symptoms of the flu include feelings of weakness or fatigue, all of which can last up to 1-3 weeks. The flu and the common cold are both respiratory illnesses, but they are caused by different viruses. Because these two types of illnesses have similar symptoms, it can be difficult to tell the difference between them based on symptoms alone. 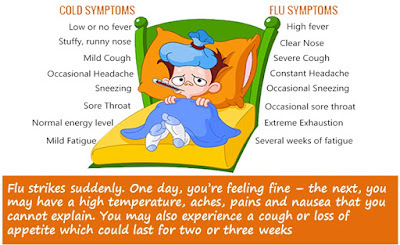 In general, the flu is worse than the common cold, and symptoms are more common and intense. Colds are usually milder than the flu. People with colds are more likely to have a runny or stuffy nose. Colds generally do not result in serious health problems, such as pneumonia, bacterial infections, or hospitalizations. Flu can have very serious associated complications. Some R&R does the body good—especially when you’re suffering from cold or flu symptoms. Wash your hands and disinfect hard surfaces around your home to avoid spreading germs. Warm, soothing liquids like hot tea and chicken soup can go a long way for a sore, scratchy throat.